Planning to Use Your Current Passport? Airlines and immigration authorities require at least 6 months’ validity on a passport to be allowed entry into a country. You apply for a new passport about 9 months before your passport’s expiration date. You do not purchase outbound travel tickets until your new passport is in your possession. Personal appearance is required for ALL applicants and all types of passport applications (new or renewal). Please bring all the requirements for passport application. Applications with incomplete documents will not be accepted. There is no appointment system for passport application. You may proceed directly to the Philippine Embassy in Berlin. Passport applications are entertained at the Philippine Embassy from 9:00 H to 16:00 H, Monday to Friday, except on holidays. Please be sure to check Philippine or German holidays in our webpage or Facebook weeks before when scheduling your visit to the Embassy. Filipinos residing in Germany can apply personally at the Philippine Embassy in Berlin or during our consular mobile outreaches. If you are living in southern Germany then you may consider applying at the Philippine Embassies in Berne, Switzerland or Vienna, Austria. For those living in western Germany, you may wish consider applying at the Philippine Embassy in Brussels, Belgium. It’s best to contact first these Embassies and inquire about procedures for applying and receiving your new passport. An appointment may have to be secured for your passport renewal application. Original Philippine Statistics Authority (PSA) documents and affidavits are for submission during passport application. If you wish to have a copy for your records, please have the document photocopied before submitting these for passport application. If you wish to have an original PSA document on your possession, kindly secure an extra copy from the Philippine Statistics Authority. 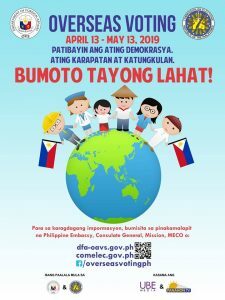 For information on how to secure a PSA civil registry document, please check their website at https://psa.gov.ph/content/e-census. Your new passport may be available in four (4) to six (6) weeks from the date the passport fee has been paid. Even then, the Embassy is not liable if a new passport’s availability is delayed due to unforeseen circumstances. Passport release can either be in person or by mail/courier. For applicants who wish to have their new passport delivered, kindly submit a pre-paid envelope, preferably from a private courier service (e.g. UPS Standard, DHL Expresseasy). NOTE: There have been cases of passports getting lost in the regular postal system. Passports left unclaimed after six (6) months will be cancelled per Department Order No. 37-03. Original Report of Marriage printed on security paper issued by the Philippine Statistics Authority (PSA; formerly NSO), if the marriage was done in the Philippines. If done abroad, Report of Marriage (ROM) issued by the Philippine Embassy in Berlin or the Philippine Honorary Consulates in North Rhine-Westphalia, Saxony-Anhalt and Thuringia, Baden Württemberg, State of Hesse, and Bavaria; or PSA issued ROM if the Report of Marriage was filed in other Philippine Foreign Service Posts. If no ROM can be produced, the applicant must first secure this from the PSA and have it authenticated with the DFA before the change of surname can be done. For those who had married in Germany and wish to file their ROM with the Philippine Embassy, please see the Civil Registry portion of this website. For those who married in Denmark, Sweden, Denmark, Norway or Finland, and who have not yet filed their ROM, then they have to apply for the ROM directly with the Philippine Embassy in Oslo, Norway. Please contact the Philippine Embassy in Oslo Norway for more details. For those who married in countries other than the ones mentioned, please review the procedures for applying for the ROM at the Philippine Embassy or Consulate with jurisdiction over the place where the marriage took place. You may send an email inquiry to the Philippine Embassy in Berlin in case you have further questions or are in need of further assistance. Please see requirements at the Special Cases section of this website. If your expired passport is an ePassport, then you may follow the procedure for Simple Renewal of Passports. If your passport is either Brown/Green (Non-Machine Readable Ready) or a Maroon (Machine-Readable Ready) Passport, then you have to follow the procedures for Applying for a Passport for the First Time/New Application. Police report with English translation done by a certified licensed translation office. Please note the Embassy cannot translate the police report for you. If possible, please provide the Passport Number / Date and Place of Issue of the lost passport and/or a photocopy of the bio-page of the lost passport. Lost Passport fee €157.50 in cash (€135.00 for the lost/valid passport + €22.50 for the Affidavit of Loss). Fee for renewal of a mutilated/damaged passport is €54 + € 22.50 for the Affidavit of Loss. The Filipino parent(s) of an infant born in Germany should file for a Report of Birth (registering the birth of a Filipino child born outside of the Philippines) in addition to applying for a Philippine passport. Please see the Civil Registry portion of this website. Applicant must submit a Special Power of Attorney (SPA) executed by the parent/s designating the minor’s companion to assist in the application process. If not executed by the parents at the Embassy, the parents’ SPA must be brought to a NOTAR and authenticated by the Landgericht. If applicant is not accompanied by mother during the application process, applicant must submit a Special Power of Attorney executed by the mother designating the minor’s companion to assist in the application process. If not executed by the mother at the Embassy, the parents’ SPA must be brought to a NOTAR and authenticated by the Landgericht. If applicant is not accompanied by adoptive parent/s during the application process, applicant must submit a Special Power of Attorney executed by the adoptive parent/s designating the minor’s companion to assist in the application process. If not executed by the parents at the Embassy, the adoptive parents’ SPA must be brought to a NOTAR and authenticated by the Landgericht. Important Reminder: The Department may require additional supporting documents as may be necessary. If applicant is born ON OR BEFORE 1950 – applicant must submit original copies of PSA Authenticated Certificate of No Birth Record and Affidavit of Two Disinterested Persons attesting to the identity of the applicant. A travel document may be issued for Filipinos who have lost their passports to allow them to return to the Philippines. A travel document is only valid for 30 days upon issuance. Filipinos who are in Germany for tourism or short-term study and have lost their passport will be issued a Travel Document to allow them to travel immediately to the Philippines. A Filipino who lost his passport in Germany and resides in a third country has no alternative but to use a Travel Document for direct, one-way travel to the Philippines. This travel document cannot be used to travel to another country.